Figure 1: Rabbit stifle joint showing the location of the patellar and tibial pins. Length A represents the patella tendon length, and length B was used as a standard to compensate for difference in magnification and positioning during sequential radiographs. Basic science studies examining the results of radiofrequency treatment on tissue have been performed using a rabbit model. Following treatment with radiofrequency, maximum load and stiffness of elongated lateral collateral ligaments in rabbits were inferior to tendons treated with immobilization only.22 In a similar study, radiofrequency was shown to be effective in restoring initial ligament tensile stiffness in the anterior cruciate ligament (ACL).23 Pötzl et al24,25 documented elongation of the rabbit patellar tendon after radiofrequency treatment in animals that were allowed physiologic loading; these effects were mitigated, but not completely eliminated, by prolonged immobilization. The effects of immobilization on preventing tissue elongation after heat modification or the duration of immobilization necessary has yet to be determined. As a result, postoperative rehabilitation after thermal capsulorrhaphy of the shoulder remains clinically speculative. Our clinical experience suggests that immobilization following thermal shrinkage is important in optimizing the results. We hypothesize that postoperative immobilization will decrease the elongation of the previously radiofrequency modified tissue when compared to nonimmobilized treated controls. The purpose of this study was to examine the effects of various postoperative treatment regimens (no immobilization, 2 weeks of immobilization, and 4 weeks of immobilization) on the length, stiffness, tensile strength, cross-sectional area, histological changes, and electron microscopic appearance compared with the contralateral control tendon of radiofrequency modified patellar tendon in a rabbit model. Institutional animal care and use committee approval was obtained prior to initiation of the study. Eighteen adult New Zealand white rabbits weighing 3 to 3.5 kg, underwent patellar tendon radiofrequency shrinkage in an animal control approved study. All animals were pre-medicated with an intramuscular injection of glycopyrrolate (0.1 mg/kg) and anesthetized with an intramuscular injection of ketamine hydrochloride (15 mg/kg) and xylazine (2 mg/kg). After induction, the rabbits were intubated and anesthesia was maintained with isoflurane and oxygen. The rabbits were placed in dorsal recumbency and a randomly selected stifle joint was shaved and prepared for aseptic surgery. The patellar tendon was approached through a medial parapatellar incision. Loose areolae tissue was removed from the surface of the tendon. Three, 0.035-inch stainless steel K-wires were placed in the patella/tibial complex. One wire was placed in the patella; approximately 1 mm proximal to the origin of the tendon and 2 wires were placed in the proximal tibia. The first wire was placed 1 mm distal to the tendon insertion. The second wire was placed 5 mm distal to the first. All intraoperative measurements were performed using digital calipers (Digimatic Caliper No. 500-351, Mitutoyo Corporation, Tokyo, Japan). The distance from the patellar wire to the proximal tibia wire was recorded as length A. The distance between the 2 tibial wires was recorded as length B (Figure 1). Initial (preoperative) and sequential (postoperative) lengths were recorded based on measurements made on lateral radiographs. The length of the tendon to be heat-treated was measured from the distal pole of the patella to the level of the tibial plateau. Quarter lengths of the tendon were then marked using a surgical marker to act as guides for even and consistent radiofrequency application over the measured length of the tissue. Tendon length and width (measured mid-length) was used to determine surface area. Radiofrequency application was based on a calculated dose of heat energy to be applied to the tendon in a medial to lateral zig-zag pattern progressing from proximal to distal with the heat probe held approximately 1 mm from the surface of the tissue. Tissue in the region of the origin and insertion of the patellar tendon was not heat-treated. To mimic in-vivo conditions of the intra-articular use of radiofrequency the Oratec heat probe system (Smith & Nephew P.L.C., London, England) was applied to the tissue in a saline environment. This was accomplished via the use of a plastic cup 5 cm in diameter affixed with a rubber base placed over the stifle joint. A slit in the base allowed the patella, patellar tendon, and proximal tibia to protrude into this cup, sealing the opening against the exposed tissue.21 The cup was then filled with saline and the radiofrequency probe was applied to the measured tendon area. On application of the heat probe, the tissue immediately beneath the probe was observed to shorten. Immediately after heat treatment, the tendon length was re-measured and the percentage of shrinkage was calculated (ΔL/Lo). The incision was closed using 4-0 polydioxanone sutures in a simple, continuous pattern. Skin was closed with 4-0 steel sutures in a simple, interrupted pattern. 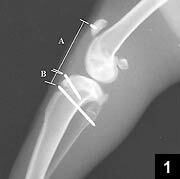 A postoperative lateral radiograph was taken of each stifle joint with the limb in 15° of flexion. Six of the animals were not immobilized (Group I) and were allowed unrestricted cage activity. A lateral fiberglass splint was then fashioned for 12 of the animals to maintain the limb in 15° of knee flexion; 6 of these animals were immobilized for 2 weeks (Group II), with the remaining 6 animals immobilized for 4 weeks (Group III). Following splint removal, the animals were allowed unrestricted cage activity. At 2, 4, and 8 weeks after surgery, the rabbits were anesthetized with an intramuscular injection of ketamine (15 mg/kg) and xylazine (2 mg/kg). A lateral radiograph was taken of each operative leg with the stifle joint in an identical angle as the immediate postoperative radiograph. Length A and B measurements were recorded from each radiograph with digital calipers. Knowledge of the intraoperative measurements allowed for calculation of a correction factor to account for radiographic magnification differences or slight alterations in positioning between sequential radiographs. Following radiographs, the patella, patellar tendon, and tibia were disarticulated as a unit from the remainder of the limb for both hind limbs on all rabbits. Tendons were wrapped in saline-soaked sponges and the limbs were immediately frozen at -80°C. Prior to mechanical testing, specimens were thawed at room temperature, and all soft tissues were removed from the patella-patellar tendon-tibia complex with the exception of the patellar tendon. The tibia was dried with ethanol and embedded in polyvinyl chloride pipe with room temperature curing epoxy. Once cured, the tibia and accompanying epoxy cylinder were removed from the pipe. The patella was embedded in epoxy within a specialized mounting bracket that allowed for secure gripping of the patella without constraining the patellar tendon.26,27 The patellar tendon was kept clear of the epoxy and moistened regularly with phosphate buffered saline. All the patella-patellar tendon-tibial complexes were mounted on a uniaxial material testing system (Model 8501M; Instron Corp, Canton, Massachusetts). To apply pure tensile loads to the patellar tendon, the tibia was mounted vertically (0° flexion) and the patella was positioned to align the patellar tendon vertically. Tensile tests done with this orientation have higher stiffness values than those done at other flexion angles.27 A 2 N pre-load was placed on the tendon 20 times to 3% at a frequency of 1 Hz followed immediately by a non-failure test to 10% at a strain rate of 10% per second. Procedures were performed under displacement-controlled conditions to achieve 3% elongation following pre-conditioning. A non-failure test was performed to achieve 10% elongation at a strain rate of 10% per second. Tests to 10% are in the linear range of the rabbit patellar tendon.21 All specimens were tested submerged in room temperature phosphate buffered saline. Tendon elongation was measured from grip-to-grip deformation. Load and displacement data were collected using a data-acquisition system consisting of a 16-bit analog-to-digital board, acquisition software (Lab Tech Notebookpro; Lab Tech, Wilmington, Massachusetts), and a personal computer. The analysis of the mechanical data consisted of a linear regression of the linear range of the load-displacement curve to determine a tangent stiffness for each specimen. Stiffness values of the experimental specimens were compared to those of their contralateral control specimens. After testing, the patellar tendon was dissected free of its tibial attachment. Cross-sectional area measurements were performed using an area micrometer.28 The slot dimensions were 7 mm wide × 2 mm deep and the measuring pressure was 0.1 Mpa x second. Areas were measured near the patellar tendon attachment, centrally, and near the tibial attachment. Thickness measurements were taken after 3 minutes to allow the readings to reach equilibrium. The cross-sectional area was then calculated from the averaged thickness reading and slot width. Cross-sectional areas of experimental specimens were compared with those of the contralateral control specimens. After mechanical testing, the tendons were dissected free from their bony attachment to the patella and bisected in the sagittal plane. One-half of each tendon was fixed in 10% buffered formalin. The specimens were embedded in paraffin and 5 µ-thick sections were cut in the sagittal plane. Sections were stained with hematoxylin and eosin and examined under light and polarized light microscopy. The remaining half of the tendon was cut into smaller sections (approximately 2×2 mm) and placed in 4% paraformaldehyde. These sections were embedded in epon-araldit and thin, transverse sections 300 nµ thick were made. The tissue was then examined using a transmission electron microscope. Collagen fiber diameter was measured from the scanned photoelectron micrographs using Sigmascan Pro (Jandel Scientific; Image Analysis Software, San Rafael, California). A pre-test power analysis demonstrated that 6 animals were required to detect a difference of 1.5 SD with a 95% confidence and 80% power. A 2-way analysis of variance was used to evaluate differences between tendon length before the thermal treatment, immediately after, and at the 4 and 8 week time points. When significant differences between groups were revealed, a Tukeys post hoc-test was performed. A paired Student t test was used to compare the tensile stiffness and the cross-sectional area measurements of the heat probed treated tendons with those of the contralateral controls. Paired Student t test was also used to compare percentage of tendon shrinkage. Differences were considered significant when P<.05. Figure 2: The effects of immobilization on patella tendon length after shrinkage as influenced by time. The average tendon length decrease following radiofrequency application was 10.31%±2.13%, measured intraoperatively. There was a significant decrease from pre-treatment length in all 3 groups (P<.01). It was possible to consistently shrink the tissue to the desired length by visualizing the tissue response in a controlled environment (Group I, 10.25%±1.9%; Group II, 9.98%±1.1%; Group III, 10.70%±3.3%). In Group I (nonimmobilized animals), the average tendon length increased significantly after the first 2 weeks of unrestricted activity as compared with immediately after radiofrequency treatment (P<.001) (Table 1, Figure 2). However, no significant increases in tendon length were observed between weeks 4 and 8. There was no significant difference between pre-treatment length and length at week 8. In Group II (2 week immobilized animals), no significant increases in average patellar tendon length were observed at either 2 or 4 weeks post-radiofrequency treatment. A significant increase in patellar tendon length was observed at 8 weeks as compared with immediately after radiofrequency treatment (P<.001) (Table 1, Figure 2). There was also a significant increase in patellar tendon length at week 8 compared to the pre-treatment length for Group II (P<.01). In Group III (4 week immobilized animals), no significant increases in patellar tendon length were observed at the 2- and 4-week periods. At 8 weeks, there was a significant increase in patellar tendon length compared to immediately following radiofrequency treatment length (P<.001) (Table 1, Figure 2). However, the patellar tendon length at 8 weeks was not significantly different when compared to the original pre-treatment tendon length. Tendon lengths at 8 weeks were significantly different for Group I as compared to Group III (P<.001) (Table1). No other significant differences in tendon length between groups by week were indicated. Figure 3: Cross-sectional area: treated versus controls at 8 weeks following heat treatment. The repeated measures analysis of the mechanical testing data demonstrated significant decreases in the stiffness of the patellar tendon in all 3 groups when compared to the contralateral controls at 8 weeks (P<.001) (Table 2B). On average, the stiffness decreased 41% in the shrunken tendons (146 N/mm) compared to the controls (247 N/mm). No significant differences were observed between the three groups. Histologic assessment of the heat-treated tendons at 8 weeks revealed a generalized fibroblastic response throughout the entire patellar tendon. This was most pronounced in the tissue immediately adjacent to the heat-treated surface and was characterized by a marked increase in cellularity and vascularity (Figure 4). Transmission electron microscopy of the controlled patellar tendon revealed a normal bimodal pattern of large-diameter (<200 nm) and small-diameter (5-100 nm) collagen fiber (Figure 5). Eight weeks after heat application, the collagen fiber pattern of the patellar tendon in all 3 groups was unimodal (with fiber diameter smaller than the small fibers found in normal tendons that are 30-50 nm). Figure 4: Hematoxylin-eosin stained histology slide of rabbit patella tendon. Control tendon: no thermal treatment (A). Group I: thermal treated tendon 8 weeks postoperatively with no immobilization (B). Group II: thermal treated tendon 8 weeks postoperatively with 2 weeks immobilization (C). Group III: thermal treated tendon 8 weeks postoperatively with 4 weeks immobilization (D). In a rabbit patellar tendon model, Schaefer et al21 characterized the healing process after thermal modification with laser energy. Distinct advantages of this in-vivo model included the ability to perform precise sequential postoperative measurements of tissue length without the need for sacrificing an excessive number of animals, as well as the ability to apply periodic tensile loads to the thermally altered tissue in a known orientation by the action of the quadriceps muscle. The study demonstrated that when animals were allowed physiologic loading following laser-based thermal shrinkage of the patellar tendons, 8 weeks post-treatment the specimens were significantly elongated as compared with their pre-treatment state. The treated tendons were also less stiff and had increased cross-sectional areas when compared to contralateral controls. Histological examination of the treated tendons revealed a generalized fibroblastic healing response. The authors concluded that thermal modification of connective tissue using laser treatment resulted in biomechanical compromise immediately following the procedure, and that the treated tissue therefore needs to be protected in the early phase following thermal modification. The effects of immobilization on tendon healing following radiofrequency treatment are not well understood. Our study findings corroborate those of Schaefer et al,21 and demonstrate that after thermal modification of connective tissue, immobilization is of critical importance in protecting the contracted collagen to minimize undesired tissue elongation. In the present investigation, animals that were either not immobilized (Group I) or immobilized for only 2 weeks (Group II) after radiofrequency shrinkage of patellar tendons demonstrated statistically significant elongation of the tissue in the early postoperative period. Moreover, in both groups I and II, the patellar tendon elongated beyond its original, pre-treatment length. Animals immobilized for 4 weeks after treatment (Group III) demonstrated tendon elongation but to a lesser extent. By 8 weeks, this was the only group to have a statistically significant decrease in tissue elongation when compared to the nonimmobilized controls. Thus, although immobilization did not prevent post-treatment elongation, immobilization for 4 weeks post-radiofrequency was able to limit the extent of elongation. Figure 5: Photoelectronmicrographs of cross-section of rabbit patellar tendon. Control tendon: no thermal treatment (A). Group I: Thermal treated tendon 8 weeks postoperatively with no immobilization (B). Group II: thermal treated tendon 8 weeks postoperatively with 2 weeks immobilization (C). Group III: thermal treated tendon 8 weeks postoperatively with 4 weeks immobilization (D). Note the thermal treated tissue reveals predominantly unimodal small diameter collagen fiber population. (Original magnification, ×66,500). In the first in-vivo study to evaluate the role of postoperative immobilization after radiofrequency induced shrinkage of collagenous tissue, Pötzl et al24,25 documented in a rabbit patellar tendon model that elongation of the treated tendons occurred in animals that were allowed physiologic loading. These effects were mitigated, but not completely eliminated, by immobilization for up to 6 weeks. Our findings corroborate their results, and in addition, provide a histologic and electron microscopic basis for the observed decrease in biomechanical performance of the radiofrequency-treated tendons. At 8 weeks, the radiofrequency treated tendons demonstrated decreased stiffness and increased cross-sectional area compared to the contralateral controls. This was seen in all three groups regardless of the length of immobilization. Length of immobilization also did not affect the time-dependent fibroblastic response or alteration in the normal bimodal appearance of the collagen as visualized by transmission electron microscopy. These findings indicate that at 8 weeks the tissue still has not completed its remodeling process, regardless of the length of immobilization. We are not sure to what extent the findings of this rabbit patellar tendon model can be extrapolated to those of a human shoulder capsule. However, this is the best model we currently have to evaluate the effects of thermal modification of collagen. In addition, we chose this particular model to directly compare our findings with those of a proven, established model using a similar biomechanical protocol. Also, immobilization following treatment was either present or absent in this investigation, and is therefore unlike clinical practice in which immobilization is gradually weaned and discontinued. As with many surgical procedures, such as thermal capsulorrhaphy and ACL reconstruction, patients are encouraged to gradually load the healing tissue, thus allowing for stress-induced remodeling to occur. This is particularly applicable since our clinical experience uses this concept for the postoperative rehabilitation programs following thermal capsulorrhaphy of the shoulder. In this investigation, if it had been possible to allow for gradual return to activity, we theorize that the thermally modified tissues may have had an opportunity to remodel and remain in the contracted state. The results of this study demonstrate that after initial thermal shrinkage, without immobilization radiofrequency modified connective tissue demonstrates a loss of tensile stiffness and elongation compared to pre-treatment length when exposed to normal physiologic loads. In this animal model, immobilization can reduce post-treatment elongation, but cannot entirely prevent its occurrence. Future studies are needed in a model that involves the glenohumeral joint and allows for the gradual application of load to the radiofrequency modified tissue to better understand the effects of immobilization following thermal modification. Bass LS, Moazami N, Pocsidio J, Oz MC, LoGerfo P, Treat MR. Changes in type I collagen following laser welding. Lasers Surg Med . 1992; 12(5):500-505. Guthrie CR, Murray LW, Kopchok GE, Rosenbaum D, White RA. Biochemical mechanisms of laser vascular tissue fusion. J Invest Surg . 1991; 4(1):3-12. Hayashi K, Hecht P, Thabit G III, et al. The biologic response to laser thermal modification in an in vivo sheep model. Clin Orthop Relat Res . 2000; (373):265-276. Hayashi K, Markel MD, Thabit G III, Bogdanske JJ, Thielke RJ. The effect of nonablative laser energy on joint capsular properties. An in vitro mechanical study using a rabbit model. Am J Sports Med . 1995; 23(4):482-487. Hayashi K, Nieckarz JA, Thabit G III, Bogdanske JJ, Cooley AJ, Markel MD. Effect of nonablative laser energy on the joint capsule: an in vivo rabbit study using a holmium: YAG laser. Lasers Surg Med . 1997; 20(2):164-171. Hayashi K, Peters DM, Thabit G III, et al. The mechanism of joint capsule thermal modification in an in-vitro sheep model. Clin Orthop Relat Res . 2000; (370):236-249. Hayashi K, Thabit G III, Bogdanske JJ, Mascio LN, Markel MD. The effect of nonablative laser energy on the ultrastructure of joint capsular collagen. Arthroscopy . 1996; 12(4):474-481. Hayashi K, Thabit G III, Vailas AC, Bogdanske JJ, Cooley AJ, Markel MD. The effect of nonablative laser energy on joint capsular properties. An in vitro histologic and biochemical study using a rabbit model. Am J Sports Med . 1996; 24(5):640-646. Hecht P, Hayashi K, Cooley AJ, et al. The thermal effect of monopolar radiofrequency energy on the properties of joint capsule. An in vivo histologic study using a sheep model. Am J Sports Med . 1998; 26(6):808-814. Hecht P, Hayashi K, Lu Y, et al. Monopolar radiofrequency energy effects on joint capsular tissue: potential treatment for joint instability. An in vivo mechanical, morphological, and biochemical study using an ovine model. Am J Sports Med . 1999; 27(6):761-771. Horn G, Spears KG, Lopez O, et al. New refractive method for laser thermal keratoplasty with the Co:MgF2 laser. J Cataract Refract Surg . 1990; 16(5):611-616. Lu Y, Hayashi K, Edwards RB III, Fanton GS, Thabit G III, Markel MD. The effect of monopolar radiofrequency treatment pattern on joint capsular healing. In vitro and in vivo studies using an ovine model. Am J Sports Med . 2000; 28(5):711-719. Moreira H, Campos M, Sawusch MR, McDonnell JM, Sand B, McDonnell PJ. Holmium laser thermokeratoplasty. Ophthalmology . 1993; 100(5):752-761. Murray LW, Su L, Kopchok GE, White RA. Crosslinking of extracellular matrix proteins: a preliminary report on a possible mechanism of argon laser welding. Lasers Surg Med. 1989; 9(5):490-496. Oz MC, Bass LS, Popp HW, et al. In vitro comparison of thulium-holmium-chromium: YAG and argon ion lasers for welding of biliary tissue. Lasers Surg Med . 1989; 9(3):248-253. Schober R, Ulrich F, Sander T, Dürselen H, Hessel S. Laser-induced alteration of collagen substructure allows microsurgical tissue welding. Science . 1986; 232(4756):1421-1422. Seiler T, Matallana M, Bende T. Laser thermokeratoplasty by means of a pulsed holmium:YAG laser for hyperopic correction. Refract Corneal Surg . 1990; 6(5):335-339. Wallace AL, Hollinshead RM, Frank CB. Electrothermal shrinkage reduces laxity but alters creep behavior in a lapine ligament model. J Shoulder Elbow Surg. 2001; 10(1):1-6. Flory PJ. Principles of Polymer Chemistry . Ithaca, NY: Cornell University Press; 1953. Gustavson KH. The Chemistry and Reactivity of Collagen . New York, NY: Academic Press; 1956. Schaefer SL, Ciarelli MJ, Arnoczky SP, Ross HE. Tissue shrinkage with the holmium:yttrium aluminum garnet laser. A postoperative assessment of tissue length, stiffness, and structure. Am J Sports Med. 1997; 25(6):841-848. Ilhami K, Eray BM, Gokhan M, Ulukan I, Levent A. Comparative effects of monopolar radiofrequency energy and conservative management of mechanical properties of elongated lateral collateral ligament in rabbits: an experimental study. Clin Biomech (Bristol, Avon) . 2004; 19(2):184-189. Dodds SD, Panjabi MM, Daigneault JP. Radiofrequency probe treatment for subfailure ligament injury: a biomechanical study of rabbit ACL. Clin Biomech (Bristol, Avon). 2004; 19(2):175-183. Pötzl W, Heusner T, Kümpers P, Marquardt B, Steinbeck J. Does immobilization after radiofrequency-induced shrinkage influence the biomechanical properties of collagenous tissue? An in vivo rabbit study. Am J Sports Med . 2004; 32(3):681-687. Pötzl W, Witt KA, Hackenberg L, Heusner T, Steinbeck J. Influence of postoperative immobilization on tendon length after radiofrequency-induced shrinkage. An in vivo rabbit study. Am J Sports Med . 2003; 31(1):36-40. Kamps BS, Linder LH, DeCamp CE, Haut RC. The influence of immobilization versus exercise on scar formation in the rabbit patellar tendon after excision of the central third. Am J Sports Med . 1994; 22(6):803-811. Ma CB, Ikeda K, Inoue N. Biomechanical analysis of the effect of loading angle on the failure mechanism of canine patellar tendon-tibia unit. Transactions of the Orthopaedic Research Society . 1996; 21:30. Torzilli PA, Arnoczky SP. Mechanical properties of the lateral collateral ligament: effect of cruciate instability in the rabbit. J Biomech Eng. 1988; 110(3):208-212. Dr Schlegel is from the Steadman Hawkins Denver Clinic, Denver, Colorado; Dr Faber is from the University of Western Ontario, Ontario, Canada; Dr Chen is from the Alpine Clinic, Franconia, New Hampshire; and Dr Hawkins is from the Steadman Hawkins Research Foundation, Vail, Colorado. The authors thank Uli Boenisch, MD and Jenna Godfrey for their help in this investigation. This study was supported by a research grant from ORATEC Interventions, Inc, Menlo Park, California. This paper was presented at the 66th Annual Meeting of the American Academy of Orthopaedic Surgeons, AOSSM Specialty Day; Anaheim, California; February 4-6, 1999. One or more of the authors had a commercial affiliation with ORATEC and received financial benefit in the form of consulting fees and or stock options. Correspondence should be addressed to: Theodore F. Schlegel, MD, Steadman Hawkins Denver Clinic, 8200 E Belleview Ave, Ste # 615, Greenwood Village, CO 80111.